If you're a marketer placing sponsored content (also known as native advertising) with a publisher -- or a publisher accepting sponsored content -- there are a few things you should know about how Google News, and Google in general, views this particular form of content. "Credibility and trust are longstanding journalistic values, and ones which we all regard as crucial attributes of a great news site. It's difficult to be trusted when one is being paid by the subject of an article, or selling or monetizing links within an article. Google News is not a marketing service, and we consider articles that employ these types of promotional tactics to be in violation of our quality guidelines ... if we learn of promotional content mixed with news content, we may exclude your entire publication from Google News." Fred & Farid are at it again with their zany work for Orangina. Three new spots, Satellite, Pigeon and Cannonball prove the importance of being the one who drinks Orangina versus the one who does not. The spots are part of the brand's new campaign, "Stay Alive. Drink Orangina." In this new iteration of the campaign, the brand has given life to its wacky animal characters and they appear in "real life" verus in cartoon. Orangina and Fred & Farid Paris-Shanghai worked with the director Gary Freedman from Glue Society (Doritos, Canal+, Nike, Fifa) to produce these three ads. Now this is interesting. 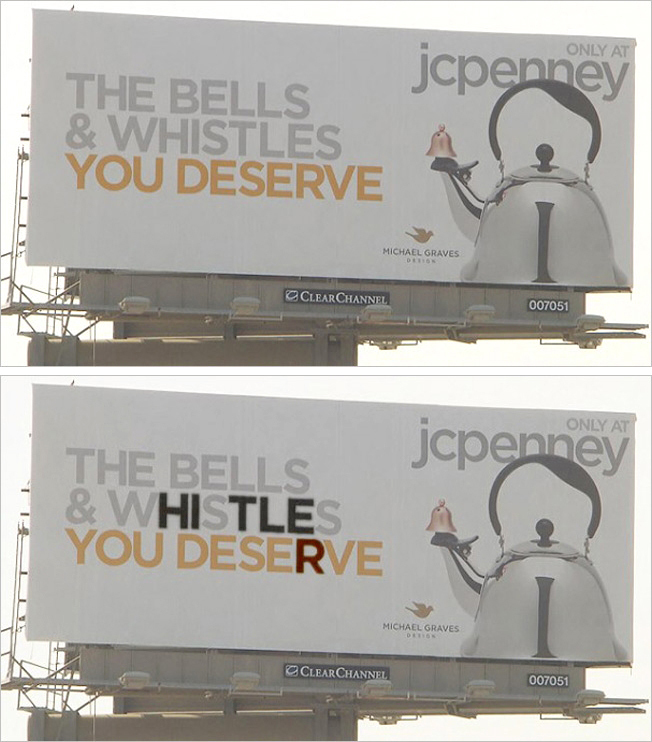 You may have heard about that JCPenney billboard in Culver City that sparked debate because the visual of a tea kettle looked like Hitler. Now, it seems, even more Hitler has been found on the board. A copywriter who publishes the VerdantMug Tumblr noticed that within the billboard's copy, Hitler's name -- in order -- is spelled out. Is this like that sick joke where some art director placed some phallic symbol on the cover of a Disney video? Or is it just an odd coincidence? We may never know. 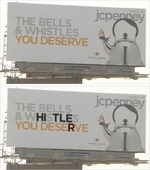 Prior to this latest discovery and following the news the image looked like Hitler, JCPEnney pulled the billboard and has said any resemblance is "unintentional." The retailer has also remove the teapot from its online store. Following its recent acquisition by Yahoo for $1.1 billion and the introduction of in-stream ads on mobile, Tumblr has launched in-stream sponsored posts that will appear on user's dashboard stream, previously occupied only by content from those they follow. Inaugural advertisers include Denny's Viacom, Ford, Universal Pictures, Capital One, AT$T and Purina. Yahoo will likely put the full force of its sales team behind this new channel so it won't be long before Tumblr sees a dramatic increase in revenue. 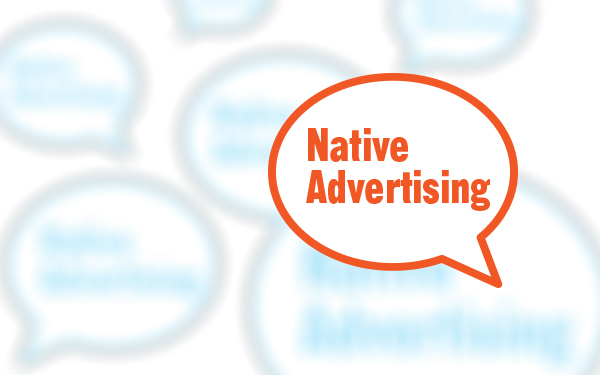 Reportedly, Tumblr generated $13 million an ad revenue last year. 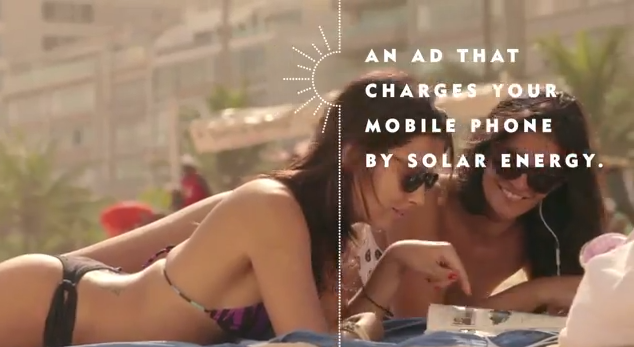 Draftfcb Brazil developed a magazine insert with solar panels and a USB port affixed to it that could be used by beach goers in Brazil to charge their phones so they never have to leave the beach. It's an interesting dovetail between advertising and product development that many agencies are now exploring. Granted, this was done for a brand and not standalone by an agency but it's unique in that it's more than just an ad. It's an actual product that is useful to the consumer in a way that perfectly relates to the product's sponsor. Sun. Beach. Sunscreen. Mobile Phone. Solar charger. It all ties together quite nicely. Here's something to spice up that mundane trip to the grocery store. To prove that Hellmann's mayonaise goes with just about anything, Ogilvy Brazil created the Food Slot, a slot machine that doles out over 280 different recipes made with Hellman's. For each one of the random 280 combinations the machine gives the shoppers a collectible recipe and an actual sample sample made with the mayonnaise. Apparently, four months of research and development were necessary to guarantee both a working system and quality food. Unilever's chefs and the engineers and tech team of production company, Hungry Man Projects, worked together to create the machine. Creating a strategy to deal with the rise of mobile devices comes down to three primary options: Developing a native app, designing a separate mobile site, or re-working your primary website with responsive design. 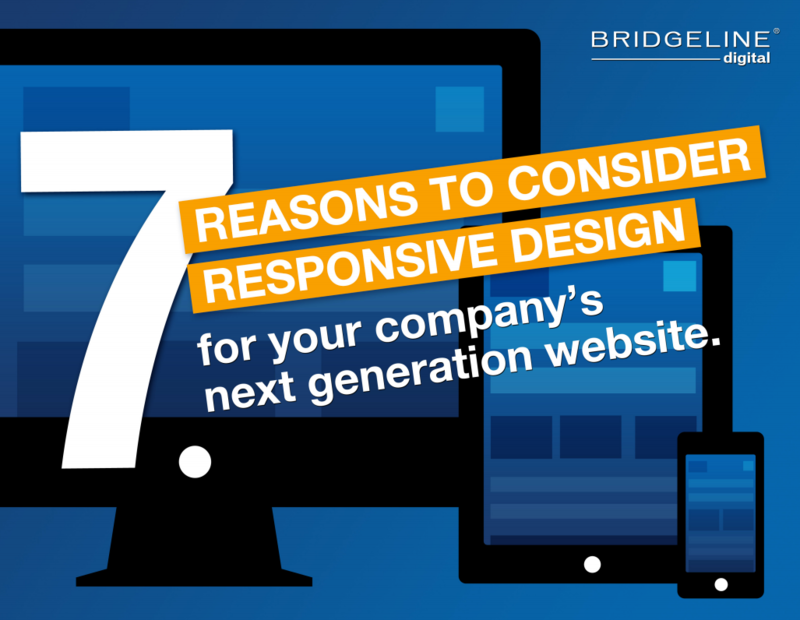 Using insight from industry experts and research data, this eBook from Bridgeline Digital, "7 Reasons to Consider Responsive Design for Your Company's Next Generation Website," explores the advantages of using responsive design to take your web presence into the mobile era. Responsive design is a fancy term to describe a website layout that works on all devices seamlessly. You create the site once and the layout adapts to and renders properly on different screen sizes. An extremely important consideration given the dramatic increase in usage of mobile devices to access the web. Download the whitepaper now and make sure your website is appropriately designed for mobile devices. It's that time again. Well, it will be come August when the The Affiliate Ball returns to Affiliate Summit which will take place in Philadelphia. 11 time Grammy nominated, hip hop artist, Busta Rhymes will be the headliner. 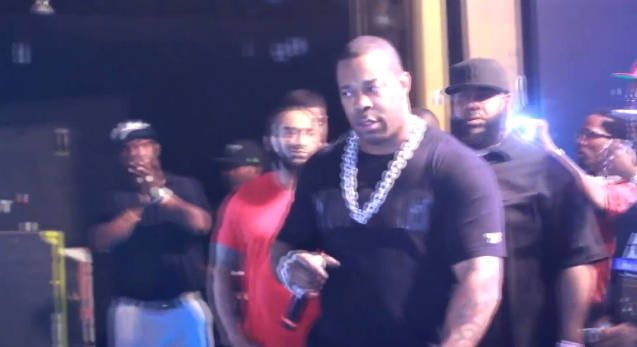 Fresh off his recent signing with Cash Money Records, and smash hit " Look At Me Now," Busta Rhymes will share his classic hits as well as his new hits with attendees of this year's Affiliate Summit.